How did you find out about Visual Novels/Otome Games? Re: How did you find out about Visual Novels/Otome Games? I came across otome games when a friend introduced a few to me (Other Age, Harvest Moon, and a few others). I was introduced to VNs by a guy I dated back in 2008. At the time I played mostly eroges (the first one I played was Crescendo). I have always liked this "choose your own adventure" type of gameplays and I love reading, so I was instantly in love with VNs in general. I guess I was first introduced to the concept of otome games when I found out about a Chinese Saint Seiya fan otome game called Summery Fancy (does this date me? XD;) but I didn't really pay attention since my Chinese was terrible (and still is orz) so I couldn't figure out how to download it. And then mannyy years later, my friend got into Hatoful Boyfriend, I decided to play it for laughs ... and got emotionally compromised instead. I started searching for more games after that but since I ownED a Mac and didn't figure out how to install Bootcamp yet, ended up searching for otome games on the iOS store, found some, and then my life spiraled out of control from there hahahaha. First time?...a friend gave me Princess Debut as a birthday gift. I liked it at first, but it grew boring after a while. Reintroduced by animanga based off Otome games. Then I did research and been playing them ever since. Harvest Moon definitely. Then I lived on a forum specific for Koei otoges (La Corda, Harukanaru & Angelique) for a few years being introduced to so many of them from then on. My first VN was Clannad - I played it after I watched the anime,mainly because I was very fond of Tomoyo. I never managed to get to a good end though - since I didn't know how VNs work I always ended up being on events that had nothing to do with Tomoyo,so... she dumped me in the end xD. Some of my friends told me about animes when I was in grade-5. Then I started watching anime and playing otome games I guess thats it.. 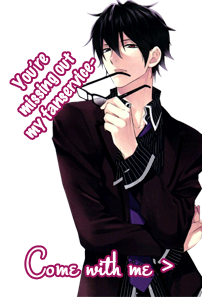 I began playing otome games when I started to watch reverse harem anime. People in the comments would be like, "This is based off the game." or "The game is totally better." And yea...So I researched and downloaded a bunch of stuff. Then one day when I was trying to find some otome games... I found this forum. i watched anime Amnesia last year and i love it ..so i searched about this anime in google ..then, i found out this anime is based-on otome game..that time i wonder what is otome game ..from there i realise existence another type of game called otome game..thats how i find out about otome game..
about visual novel..i'm sure about it..well..i'm still not clear about visual novel ..could someone tell me about it? Oh boy. Long story on my end. and i liked it alot! I'm trying to remember now; it feels like a long time ago.... I remember hearing that there were dating sims for guys, and one day I just got curious about whether such a thing existed for a female audience. I typed "dating sims for girls" into Google and found a Pacthesis game -- the culture festival game which was new at the time -- uploaded on a random free game website. I hugely enjoyed it and went looking everywhere for similar free games. There wasn't much in the english world to choose from other than Nummyz and Pacthesis (good ones though), but I soon found out about games like Tokimeki Memorial Girl's Side which had been english patched, and thus began my spiral into beautiful otome hell.